I plan weddings in Central Park, New York. Some of the couples I work with ask for extra time with a photographer so that they can to other locations in the city for photographs. Quite often, our photographers accompany the couples and their wedding party to the location of their reception or a restaurant where they will eat following the wedding, to take a few photos there before leaving them to celebrate. Sometimes, the couple wants a memento of their trip to New York in the form of photos taken further afield, around and about the city. Here are my top ten favorite places to take photos in New York City. I love Central Park, so I am a little biased, but I have kept the Central Park locations on the list to just four. Bow Bridge in Central Park. Many brides ask me about this bridge. It is made of cast-iron and spans the Lake, linking Cherry Hill with the Ramble. It is named for its shape, reminiscent of an archer or violinist’s bow. There are a couple of spots by the Lake where couples can pose for a photograph with the bridge behind them, and it is also nice to take a few photographs of the couple right there on the bridge. The Mall in Central Park. The Mall was originally designed to look like an aisle in a cathedral. The four rows of elm trees on either side form the roof of the cathedral. The quarter-mile pedestrian path is the only intentional straight line inside Central Park. It is best if you can get there early so that your photos have less people wandering by. The sun shining through the trees make any photo look spectacular, but it is especially pretty in the evenings and in the Fall when the leaves are orange. Bethesda Terrace in Central Park. This grand sandstone terrace overlooking the Lake is a feature of many couples’ photographs. It is nice to get a photo in front of the iconic fountain, and also at the top of the steps overlooking the fountain. The steps can be used to enhance a group photo, and the carvings of the terrace can be used as frames for pictures of the couple. Underneath the terrace the light makes for beautiful photos and the archways can be used as frames. The Conservatory Gardens in Central Park. This is one large formal garden divided into three smaller gardens, each with a distinct style: English, French, and Italian. The garden’s main entrance from the street is the magnificent Vanderbilt gate, a must for any photos if your wedding is in these gardens. The gardens are filled with flowers, fountains, pools and walkways bordered by trees. The Top of the Rock. Visitors can go to the top of the GE Building, that is part of the Rockefeller Center in Midtown Manhattan. Many people know that you can also go to the top of the Empire State Building, but I personally prefer the Top of the Rock because then your view has the Empire State Building in it, and also it gives a great view of Central Park. You can have photographs taken and show the location of your wedding ceremony in Central Park behind you. These gardens are in a very nice part of Brooklyn with lots of posh restaurants with great food. If you are nearby then it worth stopping here for some photos. They are famous for their cherry trees, rose gardens and Japanese gardens. We can also arrange for couples to have their wedding ceremony in the Botanical Gardens. Many brides want their photograph taken getting out of the traditional New York yellow cab, which is cool. Another typical New York method of transport if the Subway. 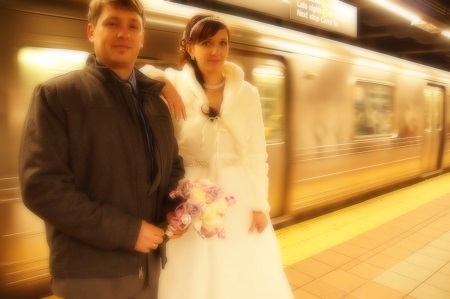 If you do travel on the Subway on your wedding day then why not take a few shots in the station, with a train in motion in the background. And of course it is worth taking a picture of the bride and groom in full wedding attire on the train itself. This is quite a small park, on the Southern tip of Manhattan, overlooking New York Harbor and the Statue of Liberty. It is quite a long way from Central Park, but worth taking a few photos if you happen to be nearby for any reason on your wedding day. There are some great opportunities to take beautiful photos of the New York shoreline and if the sky is blue the pictures will look even more spectacular. Times Square is busy. It is one of the world’s busiest pedestrian intersections. There are some great spots in which to take a few photos in the Square, during the day, or at night, when it is all lit up. There are some rooftop bars in the immediate area which have a great view of Times Square, so if you are looking for a place to have a drink on the evening of your wedding, it might be worth choosing one of those, and getting a picture of the bride and groom with a lit up Times Square in the background. This bridge was completed in 1883, connecting Manhattan and Brooklyn over the East river. It is quite a long drive from Central Park, but worth taking a few photos if you can going over to Brooklyn for anything else after your wedding. You can get some great photos of the bridge, the river and the skyline in the background from the Brooklyn side. Or you can stand on the bridge itself and make use of the symmetry of the steal wire coming down from the suspension towers. For more information on photographers to take these pictures in and around New York and Central Park, or about planning your own Central Park wedding, visit our website. Or “like” us on Facebook for lots of beautiful photos and more inspiring stories. If you have any other suggestions, please comment below. This entry was posted in New York, wedding advice, Weddings and tagged battery park, Bethesda Terrace, Bow Bridge, Brooklyn Botanical Gardens, brooklyn bridge, Central Park, photographer, The Conservatory Gardens, The Mall, Times Square, Top of the Rock, Weddings. Bookmark the permalink. You forgot in front of my apartment building (!) Just kidding — sort of. My building is really pretty; it has ivy growing up on its front. But I’ll save it for my own daughter’s pix. Seriously, loved this post. You’ve listed a good mix of tradition and contemporary sites for wedding photos. Loved those places and shots. can’t pick the best but sure the Bow Bridge is gorgeous. Such great shots and beautiful locations. Our daughter’s beach wedding in Fiji was very different!! Bow Bridge is one of my favorite photography spots in NYC. So romantic. I really love you suggestion of the subway!